The masonry walls of the Canham Natatorium reverberated with the rhythmic sound of swimmers pounding the shimmering surface of the fifty-meter pool into a froth. All the lanes were occupied by members of the defending Big Ten Champion Michigan women’s swim team. At the far end of the pool, Kelsey Newton carefully studied the strokes of the young women who swam the eight-hundred-meter freestyle relay. The sophomore who normally swam the third leg of the four-part event was lagging slightly behind the others, hampered no doubt by a badly bruised thigh that she had injured while traying. Traying was the collegiate version of sledding, in which trays borrowed from dormitory cafeterias were used instead of toboggans. The injured swimmer had lost control of her tray and tumbled harshly near the bottom of the hill. Kelsey barely suppressed a smile as she thought about her own pathetic attempts to steer those unwieldy slabs of fiberglass down the bumpy hills of the Nichols Arboretum. These morning workouts were for conditioning and building endurance; the girls essentially swam on autopilot. Kelsey made a few notes on her clipboard and returned to the poolside office. She remembered these early-morning sessions from her four years as an undergraduate at Michigan and from the thousands of miles she had swum before and since. A wall in the basement of her parents’ home bore the trophies, medals, and ribbons from her days as a competitive swimmer. As a senior, she had been the captain of this team and had led it to a Big Ten Championship and earned for herself the title of all-American. All the years of swimming had molded Kelsey Newton, sculpting every muscle of her five-nine body into curvaceous perfection. Her shoulders were broad, which only served to accentuate the curves of her chest, waist, and hips. A waterfall of straight blond hair, which she normally wore in a French braid, fell just below the level of her shoulder blades, and her eyes glittered with a shade of blue that she described scientifically as lapis lazuli. The door of the men’s locker room opened and out came a man dressed in a dark gray swimsuit. A pair of swim goggles dangled loosely around his neck and a towel was draped like a rope across his shoulders. He looked over the cavernous space, as if it was the first time he’d been here, and then began walking toward the office where Kelsey Newton sat. Like Newton, the man’s physique was the product of years spent in the water. His fair, freckled skin was tightly stretched over a lean base of chiseled muscles that were well defined, but not to the point of a bodybuilder’s exaggeration. There was a harshness to his form that suggested that the waters he was drawn from were far more turbulent than those of a fifty-meter pool. The scars that marked various points of impact on his body clearly indicated that this man was a product of the forge of violence. He was six feet tall and his clean-shaven face was accented by a thick crop of flaming red hair that he wore short. The final evidence of his Irish heritage were the green eyes that sparkled with recognition when he reached the office. “Morning, Kelsey,” he said, leaning against the door frame. Kelsey had spent most of the previous day with Nolan and his family, grieving with them and paying her last respects to Nolan’s mother, Meghan Kilkenny, who was laid to rest. Kelsey’s parents had been close friends with Nolan’s since college, and the bond between the families was, in many ways, stronger than blood. Kelsey and Nolan had been close friends during childhood. Both were highly intelligent and, to the chagrin of their mothers, equally uninterested in romantic social encounters throughout their adolescence. Together, they went to proms and other gatherings that seemed to require a couple, but theirs was a friendship more of the mind than the heart, and both seemed reluctant to risk what they had for the elusive promise of the unknown. Since graduating from high school, both had taken different paths. Kelsey had attended the University of Michigan, where she swam and majored in what she called “John Galt studies,” physics and philosophy. Her keen mind and aggressive determination had brought her to the point where, at the age of thirty, she had earned a Ph.D., a position as associate professor of physics at the university, and a sizable grant for her research into the young field of optical electronics. Her position as assistant coach of the women’s swim team, which brought her to the pool in the wee hours of the morning, was something she did out of her love for the sport. Nolan had stripped his life to the bare essentials and left the comfortable upper-middle-class world of his parents to enter the United States Naval Academy at Annapolis. His success as a swimmer paralleled Kelsey’s, and a wall in his old bedroom was similarly adorned with the symbols of his athletic accomplishments. Nolan’s brilliance in the field of computer science had led the navy to defer his enlistment for two years while he pursued a graduate degree at the Massachusetts Institute of Technology. After that, Nolan’s life took what many considered to be an unexpected turn–the quiet scholar-athlete joined the navy’s elite Special Warfare Command and became a SEAL. Assignment to the SEAL teams was considered the most demanding mental and physical challenge the navy offered–it was precisely the kind of challenge that Nolan Kilkenny found irresistible. From Kelsey’s point of view, Nolan’s assignment caused him to go from distant to secretive, but their friendship endured and their short, infrequent reunions were something they both enjoyed. “Are you ready to swim some laps?” Kelsey asked. Kelsey walked over to the pool’s edge and waited in front of the far lane. As the first swimmer from the relay team approached, she blew the whistle that dangled from a yellow cord around her neck. “You guys are done for the day. Hit the showers.” One by one, the swimmers stopped at the end of the pool. “No,” Kelsey replied, in a tone that said the matter was none of the girl’s business. The girl joined her teammates and a few giggles were heard as they entered the locker room. Nolan tossed his towel against the wall, where the floor was dry, adjusted his goggles, loosened up his arms, and dove in. The water was brisk, deliberately cool to keep the swimmers moving. His heart rate quickened as he pulled himself through the water, accelerating to match his muscles’ increased demand for oxygen. He swam four miles every day, an effort more a mental exercise than a physical one. Then again, so much of Kilkenny’s life over the past six years had been that way. As a Navy SEAL, his life was designed to be that way. This was Kilkenny’s eighth day home, his eighth day as a civilian. “Technically a civilian,” his captain had cautioned. Kilkenny had returned to Ann Arbor on a compassionate leave to help care for his ailing mother. “Technically a civilian” meant that he could still be called back to duty should a crisis arise. Thankfully, the world looked calm on this November day in Michigan. He counted off the distance in his mind, tuning out the world beyond. The rhythm of his stroke and the surging of the water around his body had an almost hypnotic effect, allowing him to enter a calm, meditative state. Kilkenny found that he did his best thinking while swimming long distances, and today he had a lot on his mind. Death had always been an abstraction for him – something he had understood intellectually but not emotionally. Prior to his mother’s death from cancer, he’d never lost anyone so close as to feel the hurt of death, to understand its meaning. Until he became a SEAL, he’d never known how it felt to be the cause of death. Kilkenny’s entire tour of duty with the navy had been spent training and working with the SEALs. In their company, he had mastered the skills necessary to achieve military objectives, skills that would keep himself and his squad alive behind enemy lines, skills that included killing. The medals and ribbons on Kilkenny’s dress uniform bespoke his leadership on missions recorded only in the classified files of the Pentagon, but they also served as reminders of those he had killed. Each of those deaths was a necessity required by either the mission’s objectives or the safety of his squad. Killing was a part of his job, but he took no pleasure from it. He had never boasted of his kills, never bragged about how many of the enemy he’d “taken out” on a mission, but he also felt no emotion, no connection to those who died. In reaching out to take his mother, death had taken on a new meaning for Nolan Kilkenny, one that numbed his heart with cruel grief and denied his mind a sensible reason. And for the first time in his life, death was personal. Kilkenny wanted to strike out against his mother’s killer, but the disease was as efficient and unemotional about death as he had been. In another part of his mind, Kilkenny now questioned whether or not he could again take another life. Nearing the end of the pool, he reached out for the side and prepared to flip-turn into another lap. Instead of touching the smooth tile wall, his hand grazed a warm, firm leg. Startled, he abruptly stopped and lifted his goggled face out of the water. On the pool’s edge sat Kelsey Newton, smiling back at him. Kilkenny nodded and stripped off his goggles as Newton pulled her supple legs from the water and walked back to the pool office. Part of his mind cursed at the thought of being pulled back, but he knew Dawson wouldn’t have called unless he’d had to. I hope it’s a quick one, Nolan thought as he copied down the flight information, knowing he couldn’t refuse the summons. Next month, I’m a full-time civilian. 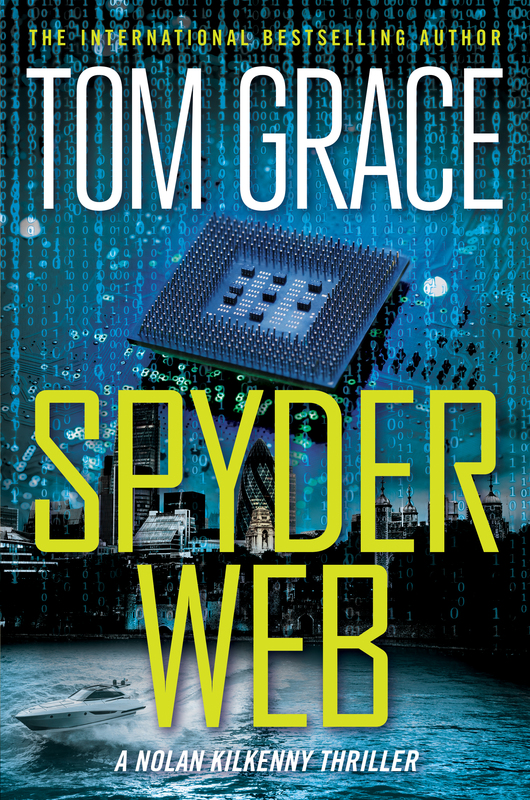 Excerpted from Spyder Web by Tom Grace Copyright © 1998 by The Kilkenny Group. All rights reserved. No part of this excerpt may be reproduced or reprinted without permission in writing from the publisher.